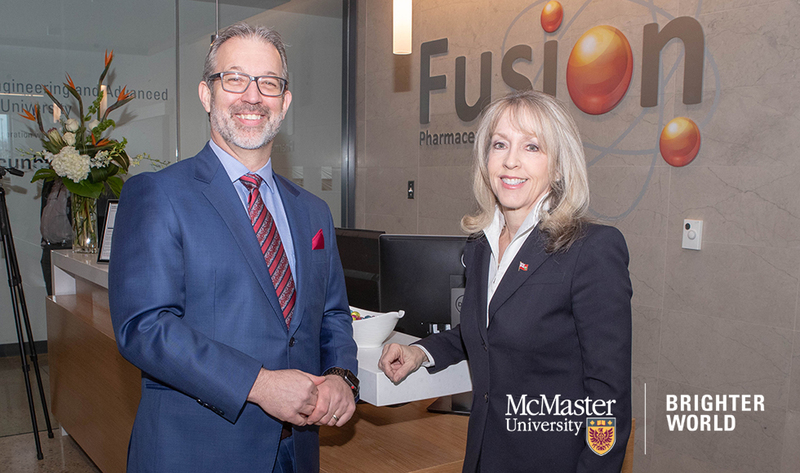 From left to right, John Valliant, Fusion’s Chief Executive Officer, with Dr. Merrilee Fullerton, Minister of Training, Colleges and Universities, at the announcement of $105 million USD in funding for Fusion Pharmaceuticals. Photo by Georgia Kirkos. Fusion Pharmaceuticals, a biopharmaceutical company founded at McMaster University and based at the McMaster Innovation Park (MIP), has secured $105M (USD) in private financing to help advance a new approach to cancer therapy based on its ground-breaking research. This new round of funding, which follows earlier investments of $46M (USD), comes from an international syndicate of leading investors. The funds will help advance the work of the company, including growing its operations in Hamilton. 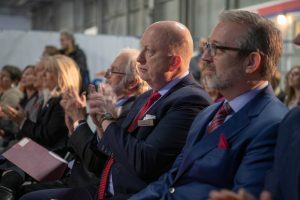 The company was spun off from the Centre for Probe Development and Commercialization (CPDC), which is located at McMaster. Fusion’s Chief Executive Officer is John Valliant, a professor of chemistry and chemical biology at McMaster. Fusion’s lead product is designed to seek out and infiltrate cancer cells and deliver a lethal and highly localized dose of radiation. Its aim is to target and damage the very DNA of the cancer cells so they cannot grow back. It is designed to attack drug-resistant tumours that do not respond to traditional therapies, which may include lung, prostate, breast and colorectal cancers. The Series B financing is being led by lead investors Varian and OrbiMed and includes US, Canadian, Irish and Swedish investors. It’s been a year of great accomplishment for Fusion. In 2018, it was recognized as Ontario’s Life Sciences Company of the Year. The award recognizes an Ontario-based company that demonstrates strong leadership and is achieving significant milestones in life sciences research and development and is working to commercialize innovative products.